Happy Pi day! I think I get wished a happy pie day more than I get wishes a happy valentines day or a happy halloween; occupational hazard. 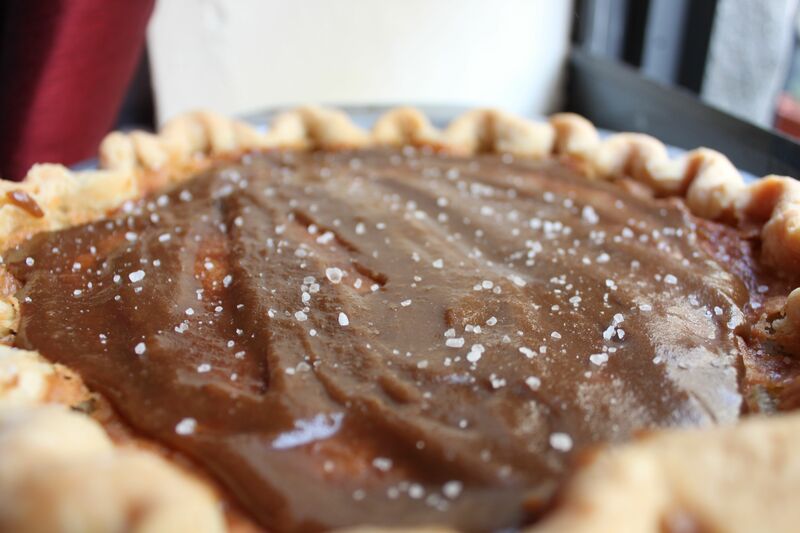 Today’s pie is a sure-to-please salty caramel pie with lots of golden, buttery goodness throughout. It was inspired by Robert Frost’s “Nothing Gold Can Stay,” and thanks to the students of Fieldston Middle School it definitely didn’t stick around. When I spoke at Fieldston a little over a month ago now, we parsed this poem in conjunction with “On Foot I Wandered Through the Solar Systems” by Edith Södergran and juxtaposed the two poets, their lives, and their work. I have a soft spot for Frost; he brings to mind summer sunlight flickering through leaves, the sound of wind in the trees, the smell of grass and dirt. I’m resisting the urge to disparage him too much here, but I feel that by contrast Frost seems almost cynical compared to Södergran. He mourns the lost of the golden hour and its promise, its potential, whereas Södergran seems to luxuriate in the depth and darkness of night. Still, there is a core truth to what Frost is saying here; the transience of ideal external conditions is what makes it so necessary for us to find those wells of stars within ourselves that Södergran describes. The poem-to-pie symbolism is pretty easy. I wanted a gold custard and settled on chess, naturally, because if ever there was something gold that disappeared in the blink of an eye it was chess pie. There’s also something sort of popular and well loved about salty caramel; it’s becoming a modern classic. Frost, while not quite so new, definitely has a similar popularity to him. Even if you’re not a poetry person, you know Robert Frost: many miles to go before you sleep, taking the less traveled path in the yellow wood, etc etc. He’s accessible on the surface, but sophisticated beneath, and I think this pie is quite the same. Combine flour, butter, and water together in a large bowl, cutting the chunks of butter into the flour until they are combined in a shaggy dough. Roll out the crust, lining the pie tin and crimping the edges, blind bake for 15 minutes until lightly browned. The filling for this pie could not be easier: you literally just put everything in a bowl and whisk it together until it’s smooth. Pour it into the cooled crust and bake for an additional 45 minutes, or until the filling is golden brown and only jiggles lightly in the middle when shaken. Allow to cool for at least 3 hours or overnight. In a saucepan, combine the brown sugar, heavy cream, and butter, whisking until the sugar melts and the mixture begins to lightly boil. Allow it to reduce and thicken until it will lightly coat the back of a spoon. 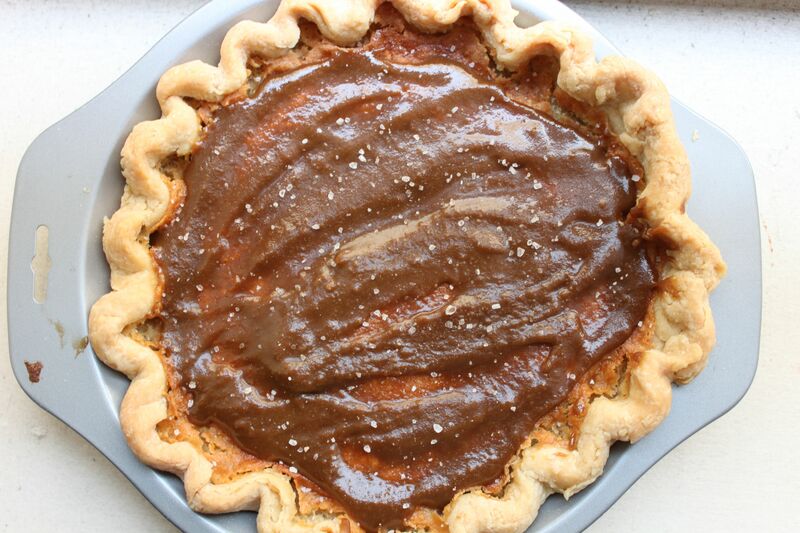 Spread the mixture while warm over the pie and sprinkle the sea salt on top. Savor in a quiet moment, with a cup of coffee. Nothing gold can stay, but that doesn’t mean it won’t come back around!